Discover the himalayan wonders and it's culture exploring two of the Himalayan nation . Nepal and Tibet which lies on the one of the highest elevation of the world . Enjoy the art ,culture , traditions and history and it's civilization. Meet & assist at the airport upon arrival and transfer to Hotel. Swayambhunath: The most ancient and enigmatic of the Valley’s holy shrines the golden-spired stupa of Swayambhunath tops a wooded hillock. Records of its history date as far as the 5th century, but its origins are believed to be older. It is the Kathmandu Valley’s most sacred Buddhist shrine and whilst its worshippers include the Vajrayana Buddhists of northern Nepal and Tibet, Newari Buddhists are the most fervent devotees. Kathmandu Durbar Square: Kathmandu’s number one tourist attraction swarms with life. Though a few of the square’s 50-plus monuments date from the 12th century, most are from the time of the Malla Kings. Probably the most famous building here is the Kumari Bahal, a building richly decorated with beautiful woodcarvings, which is home to the Royal Kumari, the Living Goddess, a manifestation of the great goddess Durga. Nearby the former Royal Palace is a Mall Dynasty dwelling, once considerably more extensive than today. Within, the courtyard Nassal Chowk, originally hosted dramatic dance performances, now it is the coronation site of the Shah kings and contains some of the finest wood carvings you will see anywhere in the kingdom. Dhulikhel is a typical Newari town with nearby Tamang villages. It is situated 30 km. east of Kathmandu on the side of Arniko Highway on the way towards Tibet. Dhulikhel is popular for its natural beauty and ancient traditions. The Himalayan ranges from the twin crest of Mt. Langtang in the west to the Mt. Everest in the east can be clearly viewed in a clear day. Dhulikhel is ideal for snow-capped peaks, sunrise, sunset and it is different from any other place. One can say Dhulikhel is where the peaks speak. Overnight at hotel in Dhulikhel. This great stupa is one of Nepal’s most distinctive monuments and one of the most important Buddhist sites in Nepal and, with a diameter of over 100 meters, amongst the largest in the world. There are a number of legends accounting for the Stupa’s construction, but it is generally believed to date from the 5th century. All Stupas contain holy relics and Bouddha is said to contain the remains of the past Buddha Kasyapa. Bouddha is a particular focus for Kathmandu’s Tibetan community and throughout the day there is a constant stream of people circling the stupa spinning prayer wheels and reciting mantras. Surrounding the stupa are six major monasteries and a host of smaller ones as well as cafes, restaurants and shops selling Tibetan carpets and Newari silversmiths. 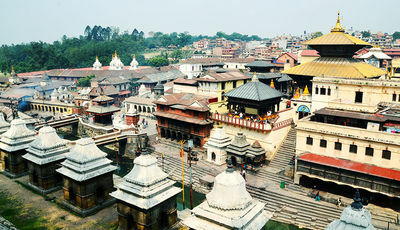 Pashupatinath: This is Nepal’s most sacred Hindu shrine and one of the subcontinent’s great Shiva sites. The supreme holiness of the site stems from the Shiva linga enshrined in its main temple and its location. It expresses the very essence of Hinduism as pilgrims, priests, devotes, temples, ashrams, images, inscriptions and cremation Ghats intermingle with the rituals of daily life, all sprawled along the banks of the sacred Bagmati River. The temple’s origins are obscure, an inscription dates from 477, but a shrine may have stood here for 1000 years before that. Sadhus in Hinduism are wandering holy men or monks revered for being good. Many Sadhus are also Yogis who are practitioners of meditation. They have chosen a life away from or at least on the edges of normal society to focus on their own spiritual practice. Talking with a Sadhu is said to either be wildly confusing or deeply insightful. Either way being able to speak Hindi is a huge advantage in deciphering what they are saying. However a few Sadhus do understand more English than you might at first have guessed. Sadhus are peaceful and do not have any possessions. Patan Durbar Square: Patan, the ancient city, once a kingdom in itself, is situated across the Bagmati River to the south of Kathmandu. Patan Durbar Square offers the finest display of Newari urban architecture in Nepal. There are temples devoted to Shiva, Krishna, Ganesh and Vishnu all actively visited by residents and visitors. At the northern end of the square the ancient sunken water tap has been restored and is still in use with young girls filling huge jugs from the carved stone waterspouts. The courtyards of the Royal Palace with their ornamented windows, columned arcades, shrines and sunken royal bath are amongst the loveliest in all Kathmandu. Visit Patan Kumari – Living Goddess: Kumari, A ‘living goddess’ made a rare public appearance to take center stage at a religious festival in Nepal. A Kumari, meaning virgin in Nepalese, is a young prepubescent girl, considered by devotees to be incarnations of the Hindu goddess of power, Kali. 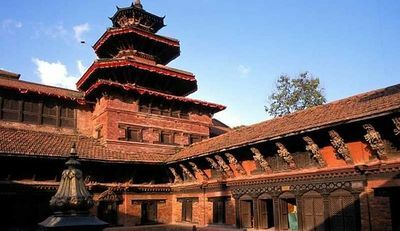 Patan Museum: The Patan Museum displays the traditional sacred art of Nepal in an illustrious architectural setting. Its home is an old residential court of Patan Durbar, one of the royal palaces of the former Malla kings of the Kathmandu Valley. Its gilded door and window face one of the most beautiful squares in the world. Overnight at hotel in Kathmandu. Early in the morning scenic drive to Kerung Border (Nepal-Tibet Border) through the beautiful Nepalese countryside and after necessary border formalities at Nepalese immigration, an hour adventurous uphill drive by Bus & Van (normally) or 2 hour walks uphill (in case of landslide to Chinese immigration, check-in to hotel or Continue drive to Kerung. Stay overnight at Guest House. Continue scenic drive crossing Over Gyatchu La (5,220M), the highest pass en route to Lhasa via Lhatse from where a road to Mt Kailash bifurcates to the west. Stay overnight at Yak hotel. Morning sightseeing to the Panchen Lama's Tashilhumpu Monastery. Drive to Gyantse and visit to the Kumbum Stupa & Phalkor Monastery. Stay overnight the Hotel. Full day picturesque drive crossing over Karola (5,010m), Kambala (4,749m), Colorful Yamdrok-Tso Lake and the Tibetan lifeline river Brahma Putra (Yarlung Tsangpo) – Stay overnight at Flora Hotel. Two full days sightseeing tour to Lhasa including Jokhang Temple, Barkhor Bazaar, And Potala Palace Drepung & Sera Monasteries. Stay overnight at Hotel. Early morning drive to Gonggar airport or train station for your departure flight to Kathmandu or to your onward destination to Mainland China. Upon arrival Kathmandu meet assist at the airport.